Security features include: Product-unique DNA identifiable ink used to print invisible fluorescent Security QR Code, the unique INKcrypt® Security Code, UV invisible security marks, erasure protection, micro print lines, security screens and artificial watermarks. UV invisiblle security marks can easily be viewed with UV black lights (included with retail box UV Secure versions of VersaCheck software). Allows users to add invisible, high-contrast UV fluorescent text and security marks. UV invisible icon and text fluoresce with exposure to UV black light. VersaCheck® - UV Secure Check Refills are the perfect high-security blank check paper designed specifically for use with all VersaCheck® software products to print custom checks that comply 100% with ANSI X9 banking standards. 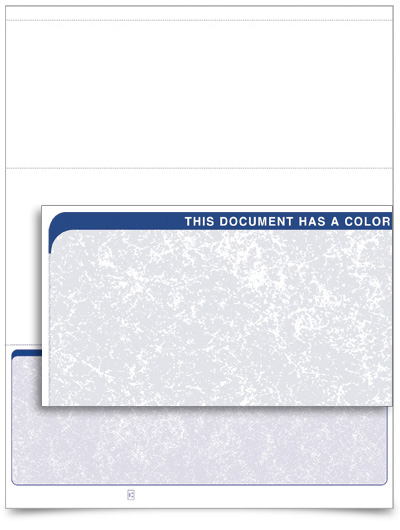 VersaCheck 8-1/2 x 11 White "micro-perforated" Canvas UV Secure check papers are perfect for printing custom check patterns, background graphics and colors. The backside of VersaCheck White Canvas Checks are pre-printed with an endorsement section and include UV Security Tags. UV invisible secuirty marks can easily be viewed with UV blacklights. Each sheet has one business-size check on the top third of page, with two stubs below, micro-perforated at 3.5", 7" and 10.5". Each check includes VersaCheck security features. For use with all VersaCheck software products (except Silver version). Please specify color when ordering: Blue, Green, Burgundy, Tan, Canvas or Stealth. Compatible with: Quicken, QuickBooks, MS Money, MAS90, Sage%reg; 100, MYOB, MY Checkbook, etc. Don't forget Check Envelopes & Deposit Slips! Product-unique DNA identifiable ink used to print the INKcrypt® Security Icon, Security QR Code, the unique INKcrypt® Security Code, UV invisible security marks, erasure protection, micro print lines, security screens, and artificial watermarks. UV invisible security marks can be easily viewed with UV black lights (included with UV Secure versions of VersaCheck software). TopSecure™ business check paper is designed specifically to use with all VersaCheck software products (except personal versions), QuickBooks®, Quicken® and more to print custom business checks that comply 100% with ANSI X9 banking standards. Save 50-80% or more per pack vs. pre-printed mail order checks. Blank check paper offers extra storage security and the convenience of updating checking information at anytime. These TopSecure™ Elite pattern business-size checks also include invisible UV Secure Fluorescent Icons and Tags which are visible under bank UV / Black lights. Each sheet (8.5" x 11") includes one check on the top third of page, two stubs below, micro-perforated at 3.5", 7" and 10.5" from top edge. Compatible with: Quicken®, QuickBooks®, MS Money®, MAS90, Sage%reg; 100, MYOB, MY Checkbook, and more. VersaCheck - UV Secure Form # 1000 Business Voucher Check Refills is the perfect superior high-security blank check paper designed specifically to use with all VersaCheck software products (except personal versions), QuickBooks, Quicken and more to print custom business checks that comply 100% with ANSI X9 banking standards. Save 50-80% or more per pack vs. pre-printed mail order checks. Blank check paper offers extra storage security and the convenience of updating checking information at anytime. These Elite pattern business-size checks include invisible UV Secure Fluorescent Icons and Tags which are visible under bank UV / Black lights. Each sheet (8.5" x 11") includes one check on the top third of page, two stubs below, micro-perforated at 3.5", 7" and 10.5" from top edge. 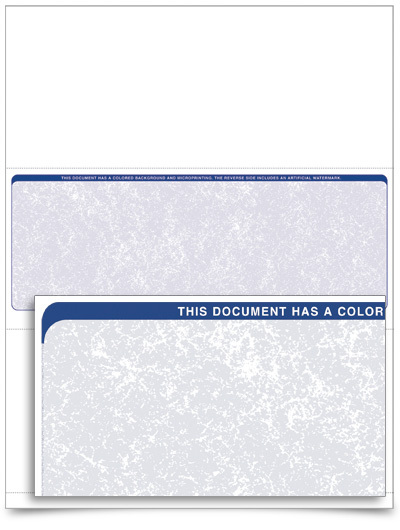 The check paper features invisible UV Secure fluorescent Icons and Tags, erasure protection, micro print lines, security screens, and artificial watermarks. Compatible with: Quicken, QuickBooks, MS Money, MAS90, Sage%reg; 100, MYOB, MY Checkbook, and more. One business-size check on top with two stubs below. Each sheet has one business-size check in the middle, one stub above and one stub below, micro-perforated at 3.5", 7" and 10.5". Please specify color when ordering: Blue, Green, Burgundy, or Tan. Compatible with: Peachtree, DacEasy, Real World, and more. 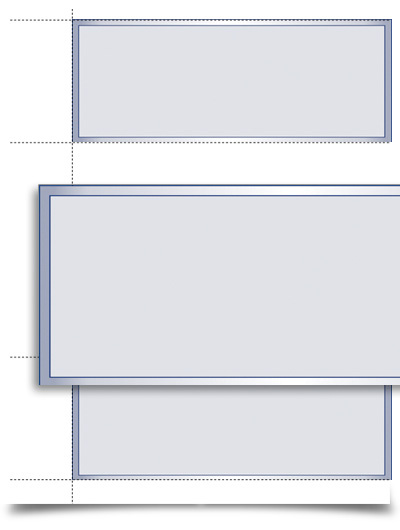 One business-size check in the middle, one stub above and one stub below. Each sheet has one business-size check positioned at the bottom with two stubs above, micro-perforated at 4" and 7.5" from top. Only available in volumes of 2,000 or more. Note: These checks (style 1002) are compatible with most corporate and enterprise accounting & check printing solutions. Please select style 1002-8M9 when using VersaCheck version 2002 or newer. One business-size check positioned at the bottom with two stubs above. 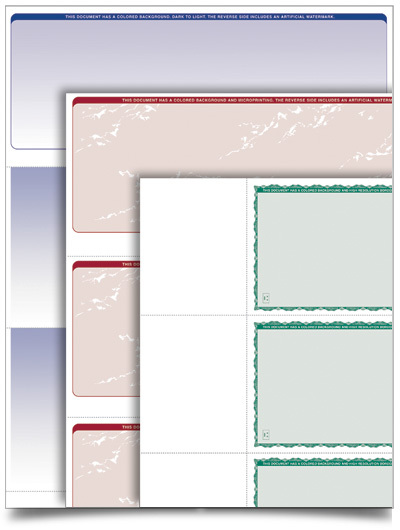 Each sheet has three business-size checks, micro-perforated at 3.5", 7" and 10.5". For use with all VersaCheck software products (except Silver Canvas or Stealth. Compatible with: Quicken, QuickBooks, MS Money, VersaCheck, Simply Money, and more. Three business-size checks per page without stubs. 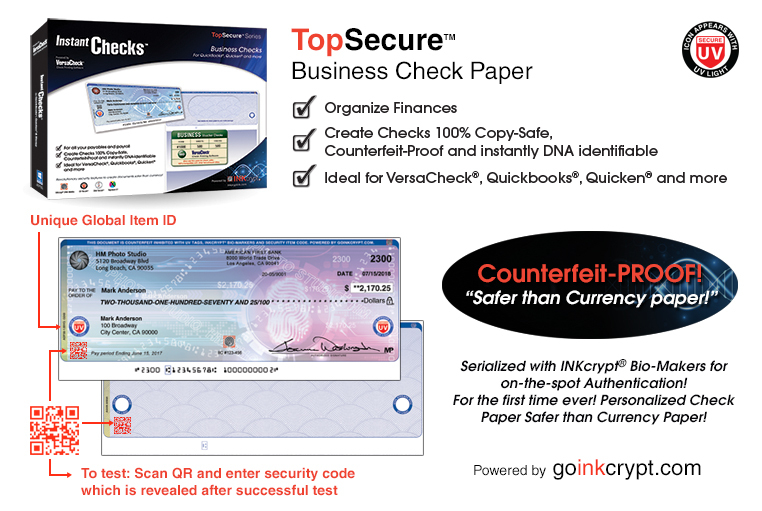 TopSecure™ personal check paper is designed specifically to use with all VersaCheck software products, QuickBooks®, Quicken® and more to print custom business checks that comply 100% with ANSI X9 banking standards. Save 50-80% or more per pack vs. pre-printed mail order checks. Blank check paper offers extra storage security and the convenience of updating checking information at anytime. These TopSecure™ Elite pattern personal-size checks also include invisible UV Secure Fluorescent Icons and Tags which are visible under bank UV / Black lights. 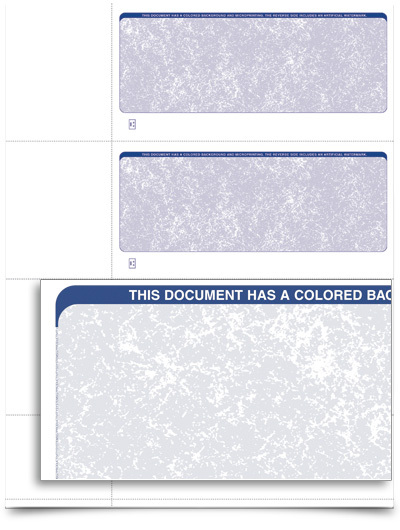 Each sheet has three personal-size checks on the page, micro-perforated at 2.8", 5.75" and 8.5" with stubs to the left of each check and an extra stub at the bottom (Check width: 6.00"). 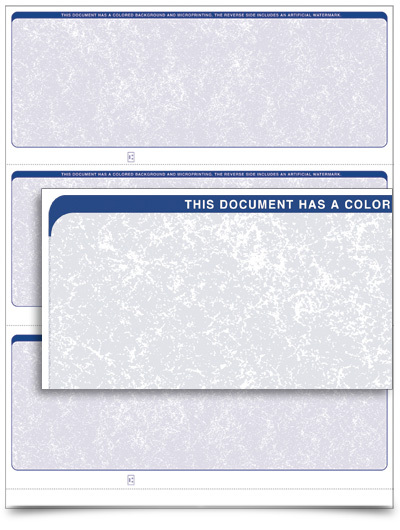 Each sheet has three personal-size checks on the page, micro-perforated at 2.8", 5.75" and 8.5" with stubs to the left of each check and an extra stub at the bottom (Check width: 6.00"). For use with all VersaCheck software products. Three personal-size checks per page with stubs to the left of each check. Each sheet has two personal-size checks on the page, micro-perforated with top strips on each check to use in assembling personal checkbooks. Each package contains 400 checks, registers/deposit slips with 20 checkbook covers, checkbook tape strips and staples... enough to make 20 complete checkbooks. Compatible with: American CheckBooks 7.0, My CheckBook Factory 8.0 (or later) and all version of VersaCheck (2003 or later editions). Two personal-size checks with top strips for assembling personal checkbooks..
Includes business and personal-size checks in assorted styles and colors. Use with any VersaCheck software program to make your own custom checks.